I consider Pulcherricium caeruleum to be the most beautiful of the corticioid fungi. Pulcherricium means "most beautiful" and caeruleum means blue. Pictures do not really do it justice at all. 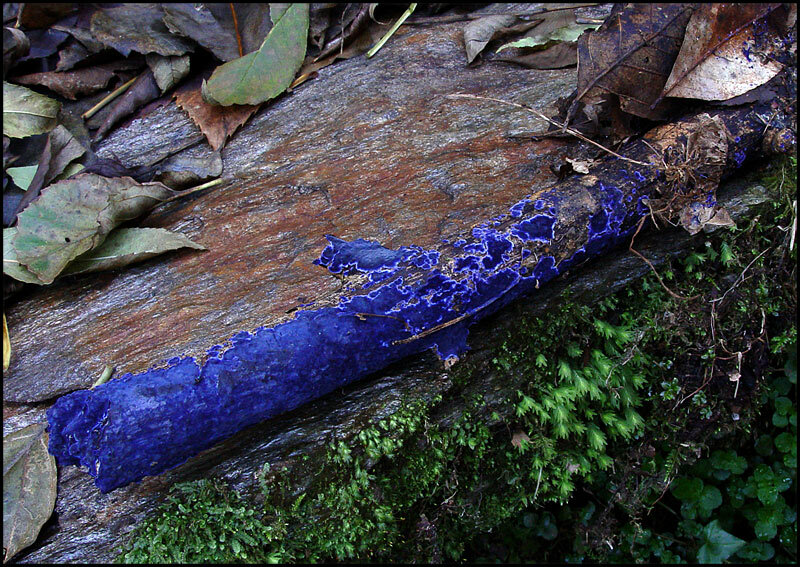 In real life it looks like someone coated a stick with blue velvet. The color shown here is pretty close to its natural color. I had in my side that I could place the branch in a confortable place. I always compare the colour of the fungi with the one seen in my display, as I like to have it natural, also when postprocessing I keep a window open with the original one. This was a pain. Slight variation of the parameters or POV changed the tones drastically. I want to repost here also, a comment I made to Willie, as I saw some mistakes in comments about mushrooms. Remember fungi are not plants ! "As far as I know, fungi does not need light at all to succeed. The main factors are temperature and humidity (appart from nutrients) . Both of them are more regular inside a cave. In fact cheeses like roquefort blue fungus is cultivated keeping the cheeses in caves. Also most industrial fungi grow in the complete darkness, there is only light in the manipulation and mantainance process. That is why is so different a common Agaricus or Pleorotus bought in a supermarket compared to a natural one, light creates a harder skin and changes the colour. " PP: crop, levels, USM, frame, resize. En mi vida pens� que exist�a algo as�... creeme. Excelente e instructiva presentacion Felipe... incriticable bajo todo punto de vista, lo siento. Beautiful. The layered composition and contrasting colors makes the cobalt blue truly take center stage. The varied textures also are suggestive of the title. Well done. P.S. also liked the detail photo as it gave a better view of the texture. Maybe before you took a shot, somebody painted this piece of wood. Just kidding. Looks so beautiful, I never seen that color of fungi before. Excellent sharpness and details. Felipe, Isn't this a song title? She wore bluuuuu-velvet ;-)) This one deserves five stars across the board. Everything looks great..Wonderful post!!! Felipe, you find the most fascinating fungi! I really like the detail posted in the workshop, great colours! Stunning! !That blue is just stunning.Excellent post the clarity of the colors is simply beautiful.A job well done. Great colours and composition, good details and DOF. Una buena imagen acompa�ada por una nota excelente. En cambio, parecer�a que tengas un poco sursatur� el color azul porque aparece no s�lo sobre las setas sino que sobre las zonas de tono im�genes cose�oras las hojas que normalmente no enarbolan el color azul. Absolutely amazing colour Felipe! I've never saw blue fungi like this. Great work and very good note also. This is extramundi,Felipe... from a spaceship , no doubt. This stuff is so far out,I wondered at first if it was real. I thought,'Ha...our friend Felipe has set up a trick shot to see if he can fool us.' It really does look that unreal. My favourite colour too. I love violet tones. Crown chakra stuff. This is really interesting, I've not seen fungi this blue before; very spectacular. All the image paramters are excellent, this is a shot to be very proud of - a favourite. PS the workshop image is just superb. Great work Felipe. Stunning shot, great colors, another perspective would give more presence to the blue part. Now I have seen it all!. This is a great composition and I find this post to be very interesting. Amazing ... Iv never seen the like of that in a fungi. The colour is so strong. Well captured. Very alien Filipe, looks like the kids covered the log with poster paint, the colour is so vibrant. we really are getting to see some of the stranger fungi of the world, nice one. WOW! Felipe, what are you showing me now. This is fascinating stuff. Neve knew this existed. I can imagine the velvet showing off more in real life but you did a great job of showing it to us. Well done. I will have a jacket in that colour, and my wive the suit! This is beautiful, Felipe. The velvet is so vivid ro be nearly felt on the picure! We have mites here in SA, very read, and also completely velvety - the y apear only after rain id the dry areas of our country. As for the agama. I never make the verical higher than 600, because then I cannot see the whole image on the screen. I you would like the full picture I will mail you a bigger one. I had no idea such things existed in such colors as living things! Remarkable fungus. Thanks for the detail in the workshop, too. I'm tempted to say that you may have pushed the saturation of the blues too much, but that may be its actual color! Nice work. Hello Filipe. Stunning colours, I thought initially it was modified but I'm blown away to know the truth. It's really very nicely composed with great contrasting colours between the blue, green and brown. Thanks, Don. Wonderful textures and so rich in colour. Perfect. Nice compsiton, beautiful set of colours. Thank you for welcoming in treknature. Con esto esta claro que la magia de la naturaleza es INFINITA. I didn't even imagine that a fungus like this could exist. Fantastic subject and quality of the shot. I've never seen anything like this. Brilliant capture. TFS! Well composed. Very well presented. The W/S composition was AMAZING.